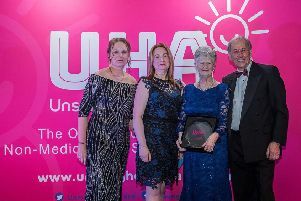 Luton and Dunstable University Hospital (L&D) has thanked fundraisers for their work in raising money to help buy a new ultrasound scanning machine for the hospital’s Breast Unit. Working with the hospital’s charitable fund, charity ambassador Denise Coates, Lisa Scheder and Challney High School for Girls raised thousands to help buy the scanner, which was unveiled on Friday. Denise took part in the sponsored run at Challney High School, organised by the hospital’s community fundraiser Bianca John, raising £3,900, Lisa organised a fundraiser for Breast Cancer Awareness Month and the hospital received a donation from former patient Angela Garrathy, to help reach the target. L&D chairman Simon Linnett said: “I would like to personally thank Denise, Lisa and Challney Girl’s school for their efforts in raising such a substantial amount, and to Angela for her incredible donation which enabled us to purchase this important piece of equipment.